Overstaying Schengen visa happens when a visitor of the Schengen zone remains in the zone for longer period then allowed by the Schengen rules. 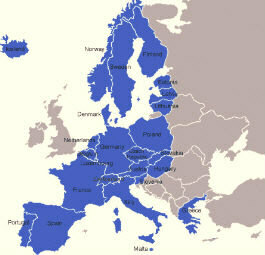 Overstaying Schengen visa can happen very easily when you for example travel to the Schengen zone (in general, we can call it Europe), you are scheduled to leave the Schengen zone on the 90th day of your stay, and you miss your return flight. Some people overstay Schengen visa intentionally. The Schengen zone has no internal borders and even the external borders are often very relaxed. Overstaying Schengen visa can be therefore very tempting. However, there can be consequences to overstaying Schengen visa. Overstaying Schengen visa can result in a number of consequences. Fine: The first consequence to overstaying Schengen visa is a fine. The state in which you remained when overstaying Schengen visa can impose a fine which can be very expensive. Record: Overstaying Schengen visa also can mean a record in your personal file saying that you overstayed Schengen visa which can make it more complicated to get Schengen visa in the future. Ban on entry: Probably the most severe punishment for overstaying Schengen visa can be a ban on entry. A ban on entry is usually issued for 1 to 3 years. A traveler overstaying Schengen visa may not be allowed back into Schengen countries for 1 to 3 years. Deportation: A very unpleasant consequence to overstaying Schengen visa is an immediate deportation when caught overstaying Schengen visa. No consequence: If you overstay Schengen visa by one or two days, you might be lucky a never have any problem or perhaps just an unpleasant interview upon your next arrival to Europe. This is however very hard to predict and depends greatly on the immigration officer that will check your passport when you try to enter Europe after you have overstayed Schengen visa. Another case is known to have been fined 550 EUR for overstaying their Schengen visa by two months in Switzerland. The practice varies by nationality and countries. Americans probably face fewer consequences when it comes to overstaying Schengen visa. Germany has some of the strictest immigration laws in the EU. Many people wonder where and when they can get caught overstaying Schengen visa. One common situation is a regular check by a police officer on the street or when in a car accident. When you get pulled over by a police, you are required to provide a proof of your identity. If you show your passport to the police officer, he can easily see when your visa was issued, and he can run a background check too. Another very common situation is when leaving the Schengen zone by air. When leaving the Schengen zone, you have to go through passport control, and that is the point where you can get caught overstaying Schengen visa. One way to avoid overstaying Schengen visa is to get a 30 day extension to the 90 day tourist visa. Most countries allow tourists to extend their visa for up to 120 days without any significant paperwork. Another option to prevent overstaying Schengen visa is to leave the Schengen zone to satisfy the 90/180 rule. Particularly since the event of 9/11 overstaying Schengen visa is treated more seriously than before the event. Overstaying Schengen visa can mean difficulty ever getting back into Europe after having overstayed Schengen visa once. For these reasons overstaying Schengen visa is not recommended. Once overstaying Schengen visa happens to you, it does not mean you are banned from entering Europe for life, and there are many people who had no problem entering Europe after overstaying Schengen visa, but remember to take the path of least resistance. Some case have also proved that it might be easier to re-enter the Schengen zone through one of the relatively recently inducted states in the east of Europe. You are welcome to discuss overstaying Schengen visa in this discussion forum. Basic fact: Overstaying Schengen may mean no problem, and thousands of visitors have not experienced any problem overstaying Schengen visa; however, there are known cases of fines of $600 and more and also cases of ban on entry to the Schengen zone for 1-3 years.